Electron capture dissociation (ECD) of a series of five residue peptides led to the observation that these small peptides did not lead to the formation of the usual c/z ECD fragments, but to a, b, y, and w fragments. In order to determine how general this behavior is for small sized peptides, the effect of peptide size on ECD fragments using a complete set of ECD spectra from the SwedECD spectra database was examined. 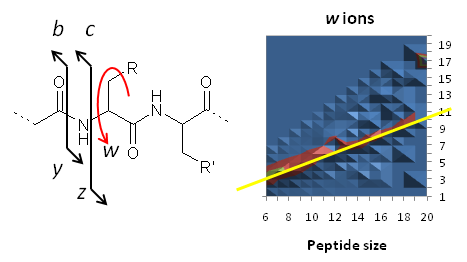 Analysis of the database shows that b and w fragments are favored for small peptide sizes and that average fragment size shows a linear relationship to parent peptide size for most fragment types. From these data, it appears that most of the w fragments are not secondary fragments of the major z ions, in sharp contrast with the proposed mechanism leading to these ions. These data also show that c fragment distributions depend strongly on the nature of C-terminal residue basic site : arginine leads to loss of short neutral fragments, whereas lysine leads to loss of longer neutral fragments. It also appears that b ions might be produced by two different mechanisms depending on the parent peptide size. A model for the fragmentation pathways in competition is proposed. These relationships between average fragment size and parent peptide size could be further exploited also for CID fragment spectra and could be included in fragmentation prediction algorithms.